Squires Gate Airport Operations Ltd.
Blackpool Airport (IATA: BLK, ICAO: EGNH) is an airport on the Fylde coast of Lancashire, England, in the Borough of Fylde, just outside the Borough of Blackpool. It was formerly known as Squires Gate Airport and Blackpool International Airport. Ownership of the airport has changed a number of times over the years until May 2008, when Balfour Beatty purchased MAR Property's 95% stake. The remaining 5% is held by Blackpool Borough Council. During 2014 Balfour Beatty claimed to be looking for a buyer for the airport and then after just one month announced that it was to close the Airport. On 15 October 2014, the airport's terminal and Air Traffic Control provision was closed with the last scheduled flights to Dublin & Isle of Man leaving in the late afternoon. In November 2014, the former company formed a new company called Squires Gate Airport Operations Ltd and the airport reopened once again in December 2014 for non-commercial operations. Executive flights are operated by Hangar 3 and J-Max which both offer access to a private aircraft hangar and private aircraft management. Bond Offshore Helicopters operate services to the offshore oil and gas facilities in the Irish Sea using two Eurocopter AS365N3 Dauphin helicopters from a purpose built helicopter terminal facility. Blackpool Airport is also home to the North West Air Ambulance service operated by a twin-engined Eurocopter EC 135. There are many other companies situated on the airfield which offer flying lessons and training flights. Blackpool Airport Limited has a Civil Aviation Authority (CAA) Public Use Aerodrome Licence (Number P724) that allows flights for the public transport of passengers or for flying instruction. Passenger numbers peaked in 2007 with over 550,000 passing through the airport, but had fallen to 235,238 in 2012. In 2014, the last year of commercial operations, the airport handled 223,372 passengers, a drop of 15% compared to the 2013 stats; this is due to the stats running from 1 January until the closure of the airport on 15 October. The airport site's first aviation use was in October 1909, when the UK's first official public Flying Meeting was held on a specially laid out site at Squires Gate, followed by another in 1910. By 1911 the site had become a racecourse and it was used as a military hospital during the First World War and until 1924. Flights from the site resumed in the early 1930s. Small UK airlines used the airfield during the mid-1930s. Railway Air Services commenced schedules to Blackpool from 15 April 1935, linking the airport with the Isle of Man, Manchester and Liverpool. Connections could be made at the two cities to London and the south and west of England. In June 1937, airline operations were transferred to Stanley Park Aerodrome. The sister of aviation pioneer Amy Johnson lived in Stanley Park, resulting in her often paying a visit; Johnson's last complete flight was a ferry flight for the ATA from Squires Gate to Oxford. A Royal Air Lao Vickers Viscount at the airport in 1968. 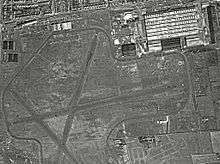 The Ministry of Aircraft Production erected a shadow aircraft factory during 1939-1940 in the north-east corner of the airfield to enable Vickers-Armstrong to operate an aircraft production facility at Squires Gate. This produced 2,584 Wellington medium bombers, several hundred of which were assembled and flown from Stanley Park Aerodrome before landing at Squires Gate for testing and delivery. The first was completed in September 1940 and the last in October 1945, when the factory closed. The factory was reopened by Hawker Aircraft in the mid-1950s to augment the production of Hawker Hunter jet fighters, under contract SP/6ACFT/9817/CB 7a. Many Hunters were also built for the Swedish Air Force. A Jersey European Short 360 at the airport in the late 1990s. Scheduled flights were resumed by Isle of Man Air Services in summer 1946. Lancashire Aircraft Corporation and other private airlines established their bases at the airport from 1946 onwards. By 1949, the airfield was controlled by the Ministry of Civil Aviation and renamed Blackpool Airport. In recent years the airport has been steadily expanding, accommodating helicopter operations for British Gas, and attracting scheduled flights from budget airlines, Jet2 and Ryanair and also scheduled services by smaller operators to the Isle of Man. Since World War II, the airport has also been a centre for private, club and general aviation. RAF Hawk jet at Blackpool Airport (2008). General Aviation area at Blackpool Airport (2004). Also in 2005, Monarch set up a new route to Málaga, three times a week. After a year though the airline ceased services, blaming low passenger numbers as the reason. However, Jet2.com had earlier announced that it would be operating flights to Málaga. Until January 2006 an Avro Vulcan bomber (serial number: XL391) was on static external display close to the entrance to the airport. XL391's last operational role was at Ascension Island during the Falklands conflict in 1982, however, it only flew as a backup aircraft and never actually went to the Falklands. It was put up for sale in October 2004 on eBay and purchased by Manchester pub landlord Chris Ollerenshaw (for £15,102.03) who had intentions to transport it to his pub and display it in his beer garden. However, after finding out that the condition of the aircraft was so poor that moving it would be extremely challenging and that it would cost over £20,000 in addition to the reported £1000 a week storage charge, Mr Ollerenshaw pulled out of the deal and later relinquished ownership of the plane back to the airport. The Vulcan was then sold on for scrap for £4,800 and was scrapped and completely removed from the site on 12 January 2006. During 2006, British North West Airlines, the smallest airline based at Blackpool has, according to its website, stopped trading for both charter and scheduled flights. Flights to the Isle of Man are now operated by Citywing, who are now flying the route up to three times a day with an onward connection to Belfast City. Citywing has brought low fares to the Isle of Man and Belfast routes and passenger numbers on these route vastly increased in January 2007. With the growth of the airport, a new carrier, the ACMI company, Jetstream Executive, operating under the name, Jetstream Express, introduced flights in 2007 from the airport to Belfast City Airport (from May), Aberdeen Airport (from June) and Southampton Airport (from July). The Belfast route was in competition with Jet2.com, who operate twice daily between Blackpool and Belfast International Airport. Two Jetstream 31s were based at the airport. However, in June 2007 a notice appeared on the Jetstream Express website stating – "With immediate effect, Jetstream Express have ceased operating the routes to Blackpool, Aberdeen, Southampton and Belfast", adding that all flights were withdrawn as the routes have not proved viable. In 2007, Jet2 cancelled its Prague and Amsterdam services blaming insufficient passenger numbers as the reason to suspend the route. The airport was owned and operated by City Hopper Airports Limited, which also owns Wolverhampton Airport and Biella Airport in Italy, until January 2007, being placed under new management after one of its two major shareholders bought out its partner. MAR Properties Ltd agreed terms to take over full control of Blackpool and Wolverhampton Airports. In May 2008, it was announced that Balfour Beatty, who also owned Exeter Airport and Derry Airport, had purchased MAR Property's 95% stake in the airport; the remaining 5% stake was held by Blackpool Borough Council. On 6 May 2008, Balfour Beatty bought the 95% stake of the airport off CityHopper Airports Ltd for £14million. The construction company also owns Exeter Airport and they stated that one of their top priorities is to re-establish a link to London, which Blackpool lost in 2007 when Ryanair discontinued its Stansted route. On 18 July 2008, the Blackpool Gazette announced that Jet2 planned to suspend its daily service from Blackpool to Belfast International for the winter. A dip in passenger numbers and the rising price of oil has taken its toll on the service. According to the newspaper, Jet2 will restart the daily Belfast service from March 2009. In the summer of 2008 Ryanair announced a large cut in capacity at a number of airports, including Stansted, from October 2008 to March 2009, although Blackpool was not affected by these cuts. However, on 25 November 2008 Ryanair announced the intention to withdraw all flights from 5 January 2009 following the airport's introduction of a £10 per person Airport Development Fee. After the £10 Airport Development Fee was introduced at the start of 2009, a new airline was sought to replace Ryanair on its very popular route to Dublin. Aer Arann were their successors and commenced operations shortly after. The short hop over the Irish Sea is operated 4 times a week by either an ATR 42 or the larger ATR 72 turboprop aircraft. The route has proven to be very popular and has the possibility of catching a connecting flight to New York directly from Dublin. The airline has since entered a franchise agreement with Aer Lingus and the route now operates under the Aer Lingus Regional brand. The flight is fully operated by Aer Lingus Regional but has a codeshare partnership with sister company Aer Lingus and Etihad Airways from the United Arab Emirates. During 2011 the airfield underwent a number of changes. Runway 07/25 was closed as an active runway and was re-opened as Taxiway C, running the full length of the old runway. The previous Taxiway C was closed and its northern part, between Runway 10/28 and the old Runway 07/25, was opened as an extension of Taxiway E. Another notable change has been the relocation of the airport's Fire Services which have been moved from north of the fuel farm to a more central position, between the terminal and some of the flying clubs, on the Taxiway B ramp. On 28 January 2012 plans were unveiled to launch a twice-weekly service to Albert - Picardie Airport with Danish Air Transport using ATR-72. The new route was planned to start in the last week of April, however, the flights were cancelled before the route was officially opened. During June 2012 Jet2.com announced plans to fly to Dalaman and Ibiza from May 2013. About a week later, the company also added Lanzarote to its destination list. Jersey had been replaced by Ibiza for the 2013 season which brought the Jet2.com destination list up to 10. 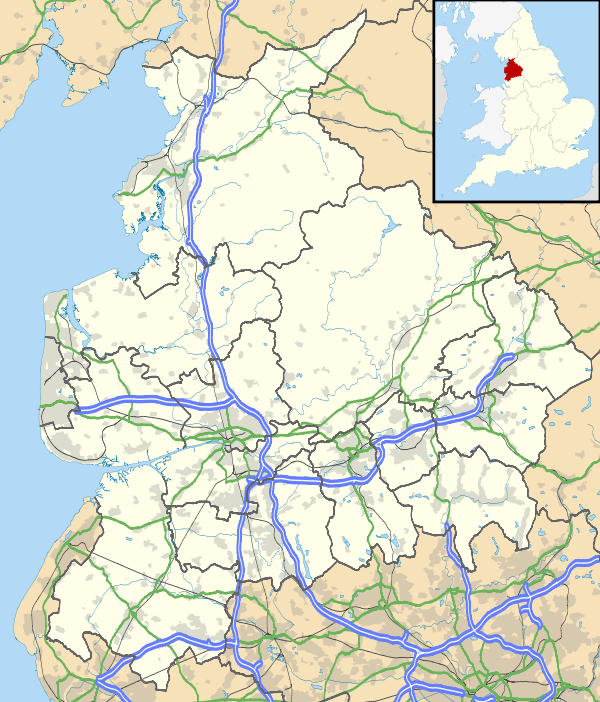 In the first week of August 2012 BBC Radio Lancashire announced that the North West Air Ambulance, based at the airfield, would be relocated to the Royal Preston Hospital so that specialist doctors could be flown quickly to an incident. The move has yet to be made as the helicopter is still based at the airfield. At the beginning of November 2012 it was announced by Jet2.com that they would fly to Lanzarote all year round. This was a further development to the schedule which saw the addition of three new destinations to airport. The addition of Lanzarote to the winter schedule now sees the company flying to three destinations during the winter months. Following Jet2.com's announcement that it would offer a year-round service to Lanzarote, the airline also revealed plans to operate the service with a larger aircraft starting in October 2013. This announcement came at the start of April, just before the summer season began. The aircraft they will use is the larger 737-800; something which has not been seen at Blackpool since Ryanair discontinued their 737-800 services in January 2009. On 13 May Jet2 announced, via their website, that they had re-added Menorca to Blackpool Airport's destination list. The weekly flight would depart from Blackpool from 21 May 2014 and would be available to book throughout the summer. Following the end of the 2013 summer season it was announced that Jet2 was cancelling their Belfast flight because of continuous falling passenger figures. The loss of the Belfast service brought Jet2's destinations at the resort airport down to 10, leaving Citywing as the only airline operating a daily flight to Belfast via the Isle of Man. Statistically 2013 was the best year for passenger movements through the airport since 2009, with 262,630 passengers using the facility. The increase was directly linked to the introduction of three new summer Jet2 destinations, Dalaman, Ibiza and Lanzarote, which increased the passenger count by around 10% over the previous year. On 4 April 2014 it was announced, via an update on the Dart Group website, that holidaymakers from across Lancashire would enjoy further choice in the summer of 2015, with a new Spanish destination from the airport. The new route, starting from May 2015, would be Reus in eastern Spain. This would take the total number of Jet2 destinations to 11 and the number of destinations to mainland Spain to four. During the last week of August 2014, Balfour Beatty announced that it was to put the airport up for sale. Local newspaper the Blackpool Gazette reported that the company had "decided to sell its operating interests in the site as part of a wider decision to sell all its interests in regional airports." The news came six years after the company bought a 95% stake in the airport for £14m. On 7 October 2014 it was announced that the airport would close on 15 October 2014 as a buyer could not be found. The final flight was Citywing V9117 to Isle of Man. The last commercial flight to depart was Flight EGL62X to Exeter International Airport, operated by Capital Air Charter. On 18 November 2014 Squires Gate Airport Operations (a firm set up by parent organisation and airport owner Balfour Beatty) bought the airport from Balfour Beatty. It was understood the operations would not be on the same scale as those before 15 October, when the airport closed with debts reaching £34m and with the loss of 100 jobs. According to Citywing's website, Blackpool is once again a bookable destination with the service restarting on 1 April 2015. This will mark the start of commercial air operations at Blackpool Airport once again after a short break. In March 2015 the government announced that a new enterprise zone will be created at Blackpool Airport, using some airport land and some adjoining land. Existing operations at the airport will not be affected. Blackpool Airport has now reopened flying to Isle of Man and Belfast but in a smaller building. It was announced in January 2016 that planning permission had finally been given, despite protests from local residents, to demolish the existing former terminal and replace it with a new Energy College for Blackpool & Fylde College. The current Citywing terminal (former Blackpool Airport admin building) is also due to be moved to a new location nearer to the main runway, although details of this have not yet been finalised. The former main terminal had been fully renovated and modernised in 2005 and was capable of handling 2 million passengers a year. The terminal has been left empty and unused since the airport closed in October 2014 and all the interiors and equipment were auctioned off in 2015. Demolition of the terminal is scheduled to commence on 1 February and take 4 weeks to complete, at which point construction of the new College will begin. As of March 18, 2016 the old Terminal has been completely demolished and is now being cleared to make way for the new Energy College. The New Citywing terminal has been fully opened in the old Jet2 ramp offices and now houses a check-in desk, reception lounge, toilets and a small departure lounge. The new facility also has access to security so passengers no longer need to walk outside and through the Vehicle Security Point. The former Administration building has been relocated next to the Citywing Terminal and is now used solely for airport staff. There are currently no further plans to build a new Terminal closer to the runway. The airport had previously seen service to 12 other destinations across Europe which were operated by Aer Lingus and Jet2.com but these flights have since been cancelled when the airport initially closed in October 2014. Citywing recommenced service to Blackpool in April 2015 and now operate flights twice daily to Belfast via the Isle of Man. For many years Blackpool has been the base of an offshore helicopter operation, flying crews to and from the Irish Sea oil fields. All offshore flights are operated through the purpose built terminal which is located next to the former main passenger terminal. Originally flights were operated by CHC Helicopter until operations were taken over on 1 January 2010 by Babcock Aviation. Babcock operate 2 Eurocopter AS365 Dauphin helicopters, G-REDF and G-REDG, 7 days a week to 5 oil platforms in the Irish Sea. The contract that was signed is due to end in 2019. 2014 stats are from 01/01/14 until 15/10/14 then from 01/12/14 until 31/12/14. 2014 stats are from 01/01/14 until closure on 15/10/14 then from reopening to GA traffic on 01/12/14 until 31/12/14. On 27 August 1941, two aircraft, a RAF Blackburn Botha trainer and a Boulton Paul Defiant fighter, serials L6509 and N1745 respectively, collided in midair over the sea, just off Blackpool's central seafront. The debris from the collision was strewn over a large area but a large part of it struck the then Blackpool Central railway station causing severe damage and killing 12 people. Both aircraft had taken off from Blackpool Airport. On 16 May 1970, a Beagle B.121 Pup, registration G-AXIB crashed during the final stage of an approach to land. The aircraft started a climb and rolled on its back, then the nose dropped while the aircraft continued to roll until it flew into the ground nose down 1500 feet short of the threshold of runway 28. Both occupants were killed on impact and the aircraft was destroyed by fire, it was not possible to determine the reason for the manoeuvre that led to the accident. Analysis suggests the manoeuvre may have been an intentional but unsuccessful acrobatic roll. On 29 June 1972, a HFB-320 Hansa Jet, registration D-CASY crashed on take-off. The pilot attempted to abort the take-off but over shot the end of the runway, crossed some grass land to the airport boundary. The aircraft then crossed over railway lines and continued into a holiday camp immediately bordering the airport, demolishing six chalets, damaging several others and finally catching fire. 2 crew members and 5 of the 6 passengers were killed. Nobody in the holiday camp was hurt. On 27 September 1982, Douglas C-47 G-AKNB of Harvest Air was damaged beyond economic repair in an accident at Blackpool Airport. 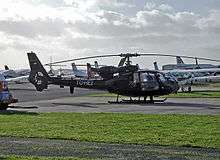 On 27 December 2006, a Eurocopter AS365N, registration G-BLUN, crashed into the Irish Sea, 24 miles offshore. There were 7 persons on board the helicopter, 5 passengers and 2 crew. There have been 6 bodies recovered and the 7th body is still reported to be missing. The helicopter was based at Blackpool Airport and the flight had also originated from the Squires Gate base. On 3 February 2007, a Piper PA-28 Cherokee registered G-BBBK was inbound to Blackpool when it crashed on the Fylde Coast. The VFR flight had originated from Exeter Airport and the pilot was attempting to land in thick fog. He failed to locate the airport and continued several miles north before losing altitude and crashing in shallow water between the central and southern piers. Both occupants were killed. On 12 March 2015, a Beechcraft Premier I registered G-OOMC was inbound to Blackpool when it overshot the runway and ended up in a grass area at the end of the runway. The private flight suffered a nose gear collapse after it over shot the runway at a high speed. Airport Fire service vehicles quickly attended to the incident and all 3 occupants including the Pilot disembarked the aircraft with no injuries. Eyewitnesses reported the jet came in too fast on the approach and touched down late on the runway. As a result, the pilot failed to stop the aircraft in time, resulting in the incident. The AAIB report for this incident is still on going. On 2 December 2015 a Rockwell Commander aircraft registered as 2-ROAM was inbound to Blackpool Airport from the Isle Of Man, The Aircraft was flying in thick cloud and fog which was as low as 200 ft. The aircraft lost contact with Air Traffic at 09:15 on the 2nd of December, The RNLI and Search and Rescue crews found wreckage from the aircraft a few miles from the coast of Blackpool. Rail – Squires Gate railway station: Northern trains to Blackpool South, Preston and Colne (East Lancashire). Bus – Blackpool Transport bus services 7, 11 and joint Stagecoach Merseyside & South Lancashire/Preston Bus service 68 stop near the airport with routes to Blackpool town centre and Cleveleys (northbound) and Lytham St Annes and Preston(southbound). Tram – Blackpool Transport tram services are available from Starr Gate terminus on the Blackpool tramway, running along the promenade, along the Golden Mile northward to Bispham, Cleveleys and Fleetwood. ↑ "Blackpool – EGNH". National Air Traffic Services. Retrieved 24 January 2009. ↑ "PROVISIONAL CAA AIRPORT STATISTICS FOR DECEMBER 2015" (PDF). UK Civil Aviation Authority. 22 January 2016. Retrieved 26 January 2016. 1 2 Bradley, Jane (14 August 2008). "Public-sector work lifts Balfour Beatty". The Scotsman. Retrieved 24 January 2009. 1 2 Parkinson, Shelagh (15 August 2008). "Profit rise for Blackpool airport owners". Blackpool Gazette. Retrieved 24 January 2009. 1 2 3 4 "UK Annual Airport Statistics". Civil Aviation Authority. Retrieved 2014-04-06. ↑ Stroud, John (20 July 1987). Railway Air Services. Ian Allan Ltd. p. 47. ISBN 0-7110-1743-3. ↑ Stroud, John (20 July 1987). Railway Air Services. Ian Allan Ltd. p. 129. ISBN 0-7110-1743-3. 1 2 "RAF Squires Gate". MadeInPreston.co.uk. Retrieved 16 August 2010. ↑ Stroud, John (20 July 1987). Railway Air Services. Ian Allan Ltd. p. 128. ISBN 0-7110-1743-3. ↑ Pooley, Robert (1966). Air Touring Flight Guide – United Kingdom – 1966. The Light Aircraft Publishing Company Limited. p. 48. ↑ "RAF Squires Gate". ControlTowers.co.uk. Retrieved 16 August 2010. ↑ "Vuelos bajo coste desde Blackpool a Murcia, Palma y Belfast". Jet2.com. 2005-09-29. Retrieved 2013-08-17. ↑ "Vulcan bomber sale nets £15,000". BBC News. 6 November 2004. Retrieved 12 June 2012. ↑ "Vulcan bomber plans 'fall apart'". BBC News. 17 January 2005. Retrieved 12 June 2012. ↑ "Goodbye to Blackpool landmark". The Bolton News. 12 January 2006. Retrieved 12 June 2012. ↑ "Jet beer garden dream realised at last". Manchester Evening News. 13 January 2006. Retrieved 12 June 2012. ↑ "Blackpool Airport". Airliner World. Key Publishing Ltd (January 2007). January 2007. Retrieved 2009-01-24. ↑ Hyde, Nick (10 May 2008). "Blackpool's London flight call". Blackpool Gazette. Retrieved 2009-01-24. 1 2 "Blackpool Airport drops Belfast flight". Blackpool Gazette. 18 July 2008. Retrieved 2009-01-24. ↑ Hyde, Nick (25 November 2008). "Ryanair to quit Blackpool airport". Blackpool Gazette. Retrieved 2009-01-24. ↑ "Ryanair Slams Development Fee at Blackpool Airport". Ryanair. 25 November 2008. Retrieved 2009-02-08. ↑ "EY to fly Blackpool to UAE". Retrieved July 1, 2013. ↑ "Jet2:New Routes". Retrieved June 30, 2013. ↑ "Jet2 offers even more at Blackpool". Jet2.com. June 2012. Retrieved 28 June 2013. ↑ "Jet2 to bring back Menorca". Jet2.com. 13 May 2013. Retrieved 28 June 2013. ↑ "Jet2 to fly to Reus from May 2015". Jet2.com. 4 April 2014. Retrieved 4 April 2014. ↑ "Blackpool Airport sell-off bid sparks new route hopes". blackpoolgaztte.co.uk. 29 August 2014. Retrieved 13 September 2014. ↑ "Blackpool Airport to close after 'no buyer found'". BBC News. Retrieved 8 October 2014. ↑ "Blackpool Airport to reopen as airfield for small aircraft". BBC News. 18 November 2014. Retrieved 16 February 2015. ↑ "G-AKNB Accident report". Aviation Safety Network. Archived from the original on 2 November 2012. Retrieved 25 July 2010. Smith, D.J. (1981). Action Stations 3 : Military Airfields of Wales and the North-West. Patrick Stephens Limited. ISBN 0-85059-485-5. Wikimedia Commons has media related to Blackpool Airport.